I really love watching the Tour de France. 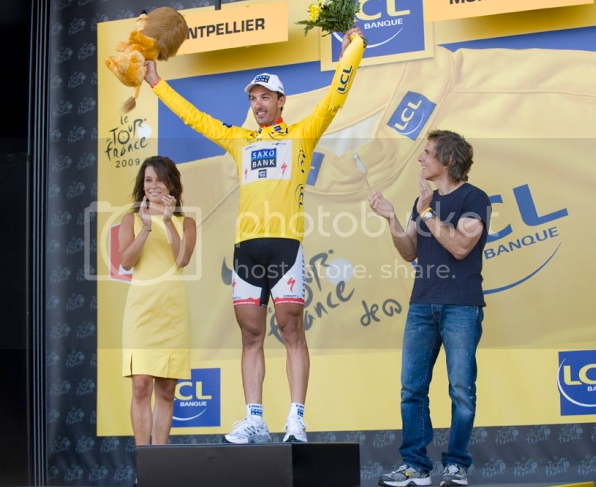 I love the athleticism, the competition, the tactics, Phil,Paul, Bob...little Tommy Voeckler. 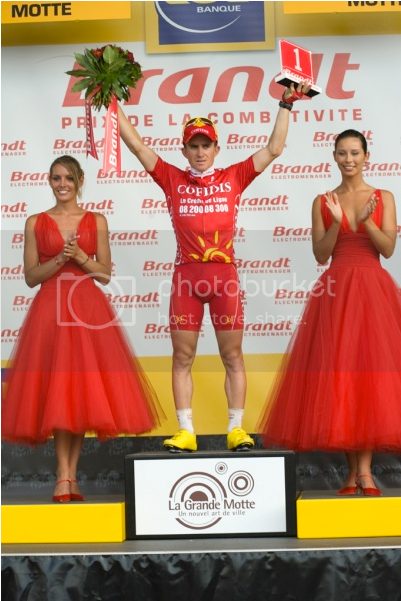 But what I love most is the Podium Girls. 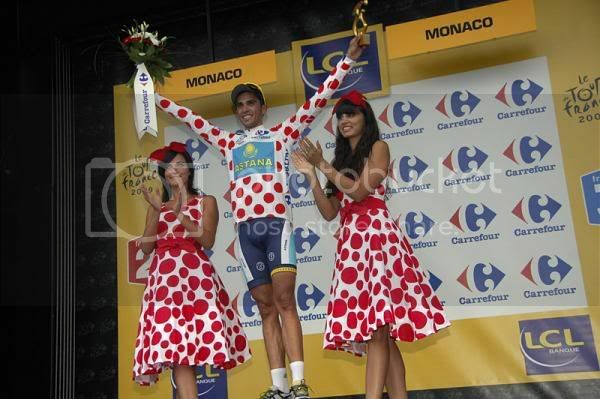 At the end of every stage the winners are presented their jerseys by girls in outfits that match the jersey they represent. They can be a little over the top...Cracks me up every time. The outfits are amusing but it kind of makes the girls look so lame. I mean, why aren't there any girls racing in the tour? I'm sure it's just one of "those" races that only men do, and that's ok if there's a women's race as well, but there isn't! And then the only women in view are wearing polka-dot dresses with gigantic bows on their heads. It's pretty pathetic. I mean, I beat Justin in the triathlon so I bet plenty of women could beat a lot of the men on the tour if we only had the chance. I think you should try out for the job. Well I think the dresses are darling. A fine example of how the french really know how to party up any occasion. I'd love to get my hands on a red polka dot dress with a gigantic bow. Cute! Also, I was totally wondering if that was Ben Stiller...we couldn't figure it out...so out of context. Yeah, Ben and Lance are friends. There's a great video of Ben riding Lance's bike right before the start of a stage. You can tell Lance thinks it's funny, but is a little worried about the bike. And Amelia, I love you, but have to disagree on this one. The Tour is one of those classic, historic events and I think it would be weird if women were allowed. I am as pro-women as the next gal (I spent a semester studying Women's History, for heaven's sake), but I am okay if there are men's events without a female counterpart. And I'm also okay that men and women are built differently (physically) and can't necessarily compete on a level playing field with each other. Each gender has its specific strengths in order to complement the other. Love the outfits! The polka dot ones are the my favorite. I don't think I've ever noticed them before. I may have to start watching this year just to see them. Oh my gosh! Sadly I've never really watched any coverage of the Tour de France...who knew I was missing out on so much! (Referring to the outfits more than the cycing, ha ha). I'm glad you posted this!